We retrospectively review our cases that underwent AM during 1994−2015. These were done in a tertiary teaching institute and the records were retrieved from the department database. Approval for conducting this study was obtained from the institutional ethics committee. For classification of open fractures, Gustilo−Anderson classification was used. Infected nonunions were classified according to H. Rosen's classification and aseptic nonunions were classified according to Muller's classification. Based on radiographic appearance, infected nonunions were further classified into atrophic and hypertrophic, similar to Muller's types. Patients were included in the study with these inclusion criteria: (1) Cases of nonunion (both atrophic and hypertrophic) that underwent AM over Ilizarov and (2) Cases of hyporegenerate detected during bone transport with Ilizarov in various conditions where AM was done. Exclusion criteria were: (1) Cases whose complete data could not be retrieved from department database and (2) Cases lost to follow-up. Criteria used to decide the use of AM has been shown in [Table 1]. Radiographic assessment of nonunion was done at monthly intervals, starting at the end of one month of final compression following two cycles of AM, till union was achieved. Union was established if there was bridging bone across fracture site in entire cross section of orthogonal views. Before fixator removal, dynamization was done by loosening threaded rods, one at a time at weekly intervals. Clinical union was confirmed by the absence of pain on weight bearing during dynamization. Hyporegenerate was assessed radiographically at the end of two cycles of AM. It was considered normotrophic if radiodense new bone appeared, continuity of bone columns was seen, cross-sectional diameter of regenerate is equal to width of bone at corticotomy site, and central radiolucent band of regenerate was around 4 mm or less. The outcome of Ilizarov treatment was assessed according to Association for the Study and Application of the Method of Ilizarov (ASAMI) bone and functional result criteria. Records of all the cases are summarized in [Table 2]. A total of 23 patients were included in the study, of which 18 were male and 5 were female. The mean age was 34.87 years (16−76 years). Bones involved were femur in 11 cases, tibia in 10 cases, and humerus in 2 cases. Ten of the 23 patients had open fractures. Duration at which Ilizarov treatment was undertaken varied considerably among the cases with maximum being 15 years. In 20 cases, prior surgical interventions were done before Ilizarov. In 15 cases monofocal, 7 cases bifocal, and in 1 case trifocal osteosynth-esis was done with Ilizarov. AM was done for hypertrophic nonunion in 6 cases, atrophic nonunion in 15 cases, and hyporegenerate in five cases. In three cases, AM had to be done for both hyporegenerate and docking site nonunion. In all the cases of nonunion, union was achieved and in all the cases of hyporegenerate, the bone was regenerated. Bone and functional results of all patients according to ASAMI criteria are shown in [Table 3] and [Table 4]. Nineteen of the 23 patients had excellent bone results and 16 patients had excellent and good functional results. 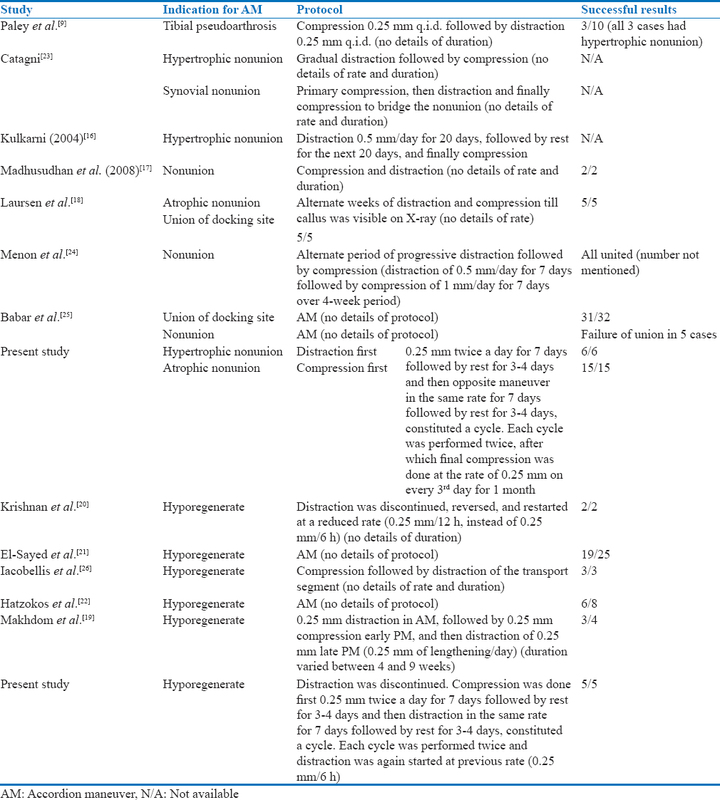 Various studies using AM for nonunions and hyporegenerate have been shown in [Table 5] with comparison to the present study, in terms of indication for AM, protocol for maneuver, and outcome. Paley D. Problems, obstacles and complications of limb lengthening. In: Operative Principles of Ilizarov by ASAMI Group. Baltimore, Maryland, USA: Williams & Wilkins; 1991. p. 352-65. Rosen H. Nonunion and malunion. In: Browner BD, Levine AM, Jupitar JB, editors. Skeletal Trauma: Fractures, Dislocations, Ligamentous Injuries. Philadelphia: WB Saunders; 1998. p. 501-41. Muller ME, Allgower M, Schneider R, Willenegger H. Manila1 of Internal Fixation Techniques Recommended by the AO-ASIF Group. 3rd ed. New York: Springer; 1991. p. 713-6. Green SA, Moore TA, Spohn PJ. Nonunion of the tibial shaft. Orthopedics 1988;11:1149-57. Catagni M. Imaging techniques (the radiographic classification of bone regenerate during distraction). In: Operative Principles of Ilizarov by ASAMI Group. Baltimore: Williams & Wilkins; 1993. p. 53-7. Catagni M, Villa A. Nonunion of the leg (tibia). In: Operative Principles of Ilizarov by ASAMI Group. Baltimore: Williams & Wilkins; 1993. p. 199-214. Paley D, Catagni MA, Argnani F, Villa A, Benedetti GB, Cattaneo R, et al. Ilizarov treatment of tibial nonunions with bone loss. Clin Orthop Relat Res 1989;241:146-65. Kulkarni GS. Ilizarov methodology. In: Text Book of Orthopaedics and Trauma. 2nd ed. New Delhi: Jaypee Brothers Medical Publishers (P) Ltd.; 2008. p. 1519-26. Claes L, Augat P, Schorlemmer S, Konrads C, Ignatius A, Ehrnthaller C, et al. Temporary distraction and compression of a diaphyseal osteotomy accelerates bone healing. J Orthop Res 2008;26:772-7. Kulkarni GS. Ilizarov methodology. In: Text Book of Orthopaedics and Trauma. 2nd ed. New Delhi: Jaypee Brothers Medical Publishers (P) Ltd.; 2008. p. 1552-74. Mora R, Pedrotti L, Bertani B, Miceli M. Treatment of noninfected nonunions: Hypertrophic nonunions. In: Nonunion of Long Bones: Diagnosis and Treatment with Compression-Distraction Techniques. Italy: Springer; 2006. p. 147-72. Ilizarov G. Basic principles of tranosseous compression and distraction osteosynthesis (translated from Russian). Ortop Travmatol Protez 1975;10:7-15. Kulkarni GS. Principles and practice of deformity correction. Indian J Orthop 2004;38:191-8. Madhusudhan TR, Ramesh B, Manjunath K, Shah HM, Sundaresh DC, Krishnappa N, et al. Outcomes of Ilizarov ring fixation in recalcitrant infected tibial non-unions − A prospective study. J Trauma Manag Outcomes 2008;2:6. Laursen MB, Lass P, Christensen KS. Ilizarov treatment of tibial nonunions results in 16 cases. Acta Orthop Belg 2000;66:279-85. Makhdom AM, Cartaleanu AS, Rendon JS, Villemure I, Hamdy RC. The accordion maneuver: A Noninvasive strategy for absent or delayed callus formation in cases of limb lengthening. Adv Orthop 2015;2015:912790. Krishnan A, Pamecha C, Patwa JJ. Modified Ilizarov technique for infected nonunion of the femur: The principle of distraction-compression osteogenesis. J Orthop Surg (Hong Kong) 2006;14:265-72. El-Sayed MM, Correll J, Pohlig K. Limb sparing reconstructive surgery and Ilizarov lengthening in fibular hemimelia of achterman-kalamchi type II patients. J Pediatr Orthop B 2010;19:55-60. Catagni M. Principles of treatment (classification and treatment of nonunion). In: Operative Principles of Ilizarov by ASAMI Group. Baltimore: Williams and Wilkins; 1993. p. 189-98. Menon DK, Dougall TW, Pool RD, Simonis RB. Augmentative Ilizarov external fixation after failure of diaphyseal union with intramedullary nailing. J Orthop Trauma 2002;16:491-7. Babar IU, Afsar SS, Gulzar M. Treatment of segmental tibial bone loss by distraction osteogenesis. JPMI 2013;27:78-82.